In Once Were Pacific: Māori Connections to Place, Alice Te Punga Somerville illustrates how Māori and other Pacific peoples draw their identity not only from land but also from water. She interrogates the relationship between indigeneity, migration, and diaspora, focusing on texts such as poetry, fiction, theater, film, and music, viewed alongside historical instances of performance, journalism, and scholarship. Te Punga Somerville’s work fundamentally articulates a more expansive understanding of place. In this excerpt from the book’s introduction, she reflects on writing from that unbounded place. Any book is a product of place: one always writes somewhere, and I am writing in a discipline, in a university, and in Aotearoa. Throughout Once Were Pacific, arguments will return to the place of place, from this point right here through until place is given the final word in the epilogue. The roots of this book lie partly in a chapter of my doctoral dissertation, written in the lands of the Cayuga Nation (upstate New York) and the Kanaka Maoli (Hawai̒i), but more particularly, the roots of Once Were Pacific are embedded in this place. One specific point of genesis for this project was an interaction in Hawai̒i when someone mentioned that he was pleased that there was another Pacific Islander in the English department that year; I replied, “Awesome—who is it?” before realizing that the person was talking about me. In that moment and that place, a Māori person was unproblematically Pacific Islander, but Māori and Pacific Islander are distinguished in New Zealand to the extent that I had not recognized myself when I had been spoken about. Who was that Pacific Islander in the English department? For my part, I have mobility in my blood: I am a member of the Te Punga family, and our tribal connections are primarily to Te Ātiawa. After living in Taranaki on the west coast of the North Island since arriving across the Pacific Ocean from Hawaiki many generations ago, we migrated farther southward to the Wellington area—to the land around the harbor in which Matiu Island is located—in the early nineteenth century. Although that is our home base, we have been moving ever since, as individuals and in small family clusters. I was born here in Wellington, but when I was five years old, my immediate family moved to Auckland, where I attended a school in which almost all the kids were Pacific (Māori and Pasifika). Although one tends not to notice these things when one is small, on reflection, I can see how all of this affects who I am today and, importantly, why this is my first book. There are many stories to be told about Māori writing in English and many places to tell them. I have felt some urgency around telling this particular story—Māori articulations of connection with the Pacific—because it helps to answer questions that were in the air I breathed growing up and because the relationship between Indigeneity and migration is so crucial to Indigenous creative, cultural, political, and theoretical activities in the present. Over the course of five days, descendants of Tākitimu celebrated their connections and shared stories and cultural products. Wānanga and other learning opportunities enabled the connections to be communicated and debated during the festival. I hope this book will provide space for other kinds of conversations alongside those we are already having about Māori, about writing in English, about Māori writing in English, about Indigeneity, and about the Pacific. Once Were Pacific has regional and global roots but has been written in Aotearoa. If I lived elsewhere—indeed, when I did live elsewhere—the questions that would matter would be differently configured to the ones I ask in this book. This book asks questions that are important here, and yet writing from and in a specific place is not necessarily the same as parochialism. This book seeks to speak with, rather than for, others; it also seeks to refrain from speaking at others. Although I have provided cultural and linguistic translations at some points throughout the book to offer hospitality to a wider readership, this is not a visitor’s manual or travel guide. I anticipate that the tight focus of Once Were Pacific on Māori will, rather than produce barriers to consideration of its arguments in allied contexts, ultimately enable more robust extrapolation of its claims beyond Aotearoa. The specificities of the discussion will better enable connection rather than separation. As I write about the dynamics of connection and borders between Māori and Pasifika people during the 1970s Dawn Raids, for example, I cannot help but think about other borders as they are negotiated in the present day in relation to the designations “Indigenous” and “migrant.” Or, to extend the previous example, in Hawai̒i, a Māori person may well be a Pacific Islander, but is a Hawaiian? Alice Te Punga Somerville (Te Ātiawa) is author of Once Were Pacific and senior lecturer at Victoria University of Wellington, where she teaches Māori, Pacific, and Indigenous writing in English. "Alice Te Punga Somerville’s Once Were Pacific is the first major study of how Māori and Pacific people talk to each other in Aotearoa/New Zealand and Oceania. It is a splendid book, remarkably lucid, insightful, comprehensive, and accessible." 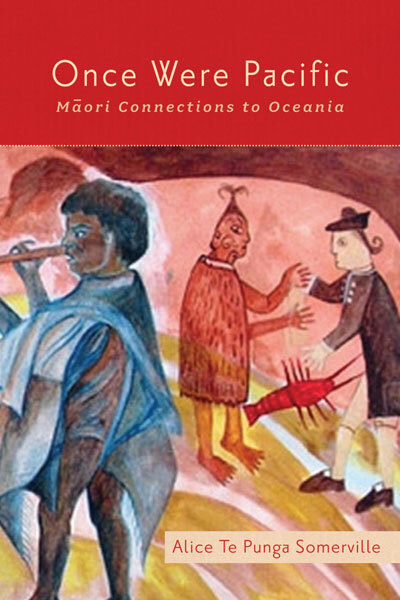 "Once Were Pacific will help us to push beyond orthodox understandings of complex and contemporary Indigenous identities and representational practices through rigorous scholarship that is Māori focused." [i] Further information about these original journeys is plentiful. For example, see K.R. Howe, ed., Vaka Moana, Voyages of the Ancestors: The Discovery and Settlement of the Pacific (Aukland, New Zealand: David Bateman, 2006). [ii] The paepae is the space from which orators speak. This post has been published in partnership with First Peoples.